First things first: I had no idea it was so easy to make homemade energy bars! That being said, I have to confess that this recipe took AGES to perfect, a rather humbling experience. I mean, creating an energy bar should be so simple, right? After five (yes, FIVE) failed attempts, these one-step beauties were created and were a crowd favourite by a landslide. Let’s just say that I was a frequent flyer at Nature’s Fare Markets, they have the best selection of healthy ingredients for making energy bars (over and over again). And hey, the ‘fails’ made for an awesome cereal! Since having our little guy Max, I’ve started to hit the gym again and am paying more attention to what I eat surrounding my workouts. Staying properly fueled before and after workouts helps us get the most out of our time exercising and speeds up recovery. These bars are perfect if you want to snack on one 45-60 minutes before a workout or immediately after to refuel. They’re also awesome if you just want a snack. Do you really need an excuse? Like most foods, portion control is still important here. If you are making 18 bars each bar has around 190 calories, 6.5 g protein, 10 g fat and 28 g of carbohydrate. 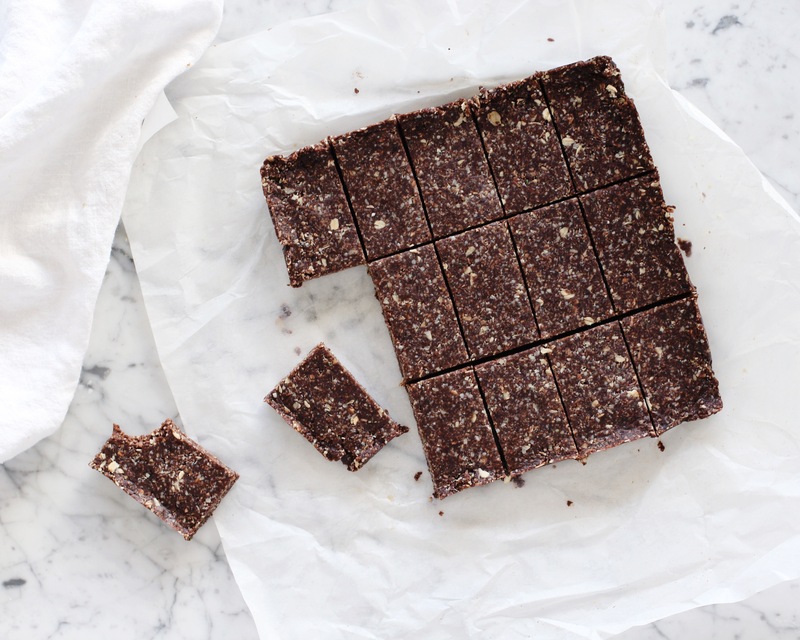 These bars are rich in healthy fats, loaded with fibre, sweetened mostly from nutritious dates, and are gluten-free for those who need to avoid it! Of course, if you are needing to avoid gluten entirely be sure to use gluten-free versions of all of these ingredients (ie: gluten-free oats). Prepare a 9×9” square pan by greasing the pan and lining it with parchment paper. Place all of the ingredients in a food processor and pulse until the ingredients are fine and the mixture sticks together. Pour the ingredients into the prepared pan and pat down evenly and firmly (use another small piece of parchment paper to press it down so that the bars don’t stick to your hands). Refrigerate for at least 1 hour or overnight before removing the bars from the pan and cutting into rectangle pieces. Thank you Nature’s Fare Markets for making this healthy post happen! Thanks for the awesome recipe Tori! I can’t wait to make these and love that they use tahini. I love your hummus recipe and use my tahini for that all the time but so nice to have another staple. Yum! Thanks so much Margaret! Have a wonderful week!!! These look delicious! Do you have a recommendation for substituting the coconut. I know I’m likely in the minority when I say I’m simply not a fan of coconut. Thanks! Hi Amanda! I think you could get away with subbing it with half hemp seeds and the other half oats. Let me know if you try! Made them today. Delicious !!! So much fun to make. Thank you very much for this recipe. Thank you for the feedback Fabienne!!!! I just made these with my kids! Delicious. Definitely a recipe I’ll be bookmarking and making again (I’m also a big fan of your strawberry frozen yogurt too). Thank you! Hi Tori, these sound delicious. Is there something I could use instead of oats? Even gluten free oats bother my digestive system. Thanks in advance! Hi Christina! You could try another rolled grain such as spelt, or something similar that you can tolerate better. I’m not sure how it would turn out as I haven’t tried it! Thanks Tori! I’ll give that a try! Greatly appreciated! Thanks for letting me know Chantale! So happy you liked them!! Tori! I am your new biggest fan! These are so yummy =) Can’t wait to try out more of your recipes. Thanks!